Still in school? Here’s an interactive book and poster project I’ve assembled that could be a welcome resource to help students explore and learn about a real world topic of interest. I hope this book will get used during these final days of the year. I am excited to be hosting a Google Docs Writing webinar next Thursday evening for Simple K12 as part of a free evening of Google. Join me and a lineup of fantastic presenters for a fun and informative evening of learning. We hope you can join us! If you’ve ever gone to school in the Midwest, you’ve probably experienced the threat of a tornado. 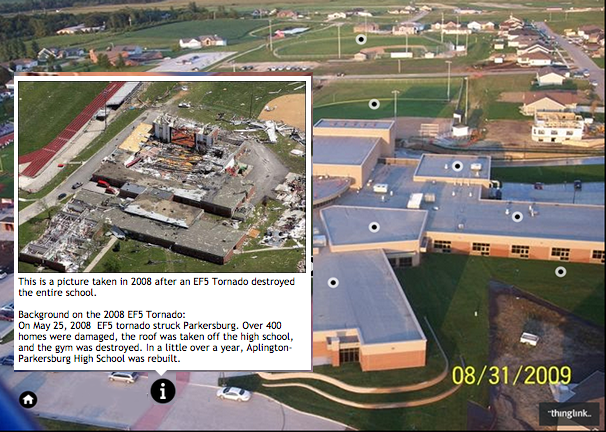 Students at Aplington-Parkersburg High School in Iowa lived through one on May 25, 2008. Corey Goetsch, a teacher and coach at the high school in Pakersburg, IA documented the story of the rebuilding of the school through an interactive image and shared it through the ThingLink Creative Challenge, Show Us Your School. It serves as a comprehensive collection of personal content to document this catastrophic event. Please explore the story of the rebuilding of Aplington-Pakersburg High School, with an added title page that has been remixed to introduce the story by highlighting an award-winning documentary by student Matthew Wicks. Use the arrow to advance to the next page to explore Corey’s complete interactive image. Every school has a story. ThingLink helps you tell stories through text, images and rich media like never before. Students connect with the content as they create, remix and capture learning as it happens. They can express themselves through text and images to support their ideas and demonstrate learning across all grade levels and curriculum areas. ThingLink for Education helps students and educators develop 21st Century Skills and enrich their enthusiasm for learning. Explore the schools who have joined our journey and placed themselves on our interactive map. Join the ThingLink Classroom Creative Challenge to tell your story and Show Us Your School! The end of the year is the perfect time to show appreciation for the educators who have worked very hard to help our children learn and grow throughout the year. With already hundreds of thousands of teachers and students using ThingLink to create interactive images and videos, parents can power up their favorite educator’s or school’s digital toolkit with a ThingLink EDU Premium account for the entire year. Teachers and students love ThingLink and our EDU Premium features help them unlock the full potential of interactive images and video within a safe and secure classroom environment. Explore this example to see how Meghan Zigmond and her 1st grade students love ThingLink! ThingLink EDU Premium is packed with features for engaging students in 21st century learning experiences that support individual learning needs. Please explore this interactive book as another example of the powerful possibilities that exist for teaching and learning with ThingLink. During May you can support ThingLink’s educational use, and upgrade the whole school to ThingLink Premium EDU for only $350. I want to upgrade my teacher for $35! Donate $35 to the Free Interactive Books project and mention the name and email address of the teacher who gets the upgrade in the comments. We will contact the teacher and let them know about your gift! I want to upgrade my school for the special price of $350! Donate $350 to the Free Interactive Books project and mention the name of the school and a contact person who will become the administrator of the Verified School Account. Or, email us at education@thinglink.com and we will handle the upgrade process for your school. Teachers, here is a badge to display on your own blog or website to show how much you would appreciate the chance to explore the powerful possibilities of ThingLink EDU Premium. Feel free to forward this post to your Parent/Teacher Organization or let us know who we can contact for you. For more information, drop us an email at education@thinglink.com. I am fortunate to have the opportunity to teach a group of 1st graders for 20 minutes on most days at my school. These are students who have passed out of their phonics program and I get to work with them to use tech as a tool to build literacy skills. 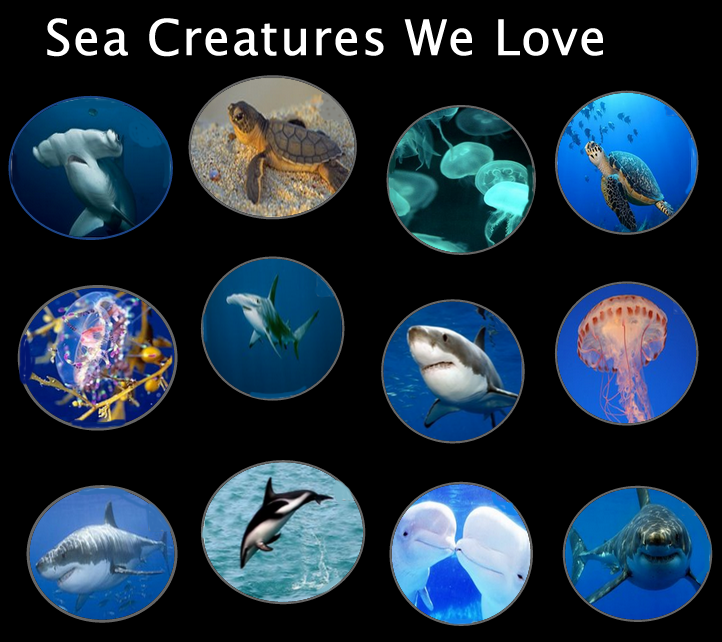 Recently our group of little learners has been authoring a collaborative ThingLink interactive image book about Sea Creatures. The most remarkable and useful teaching piece here involves the use of immediate feedback, a powerful way to leverage the power of technology for teaching and learning. It is particularly exciting to be able to communicate and work with these young emergent readers in a virtual environment to personalize their learning. Please explore and enjoy our interactive image book in progress and consider the possibilities for learning that exist for student authors of any age with ThingLink interactive image books. Christi Collins is an amazing educator who is passionate about using ThingLink for Education. She combines her great sense of instructional design with creativity and enthusiasm to create ThingLink powered learning experiences for her primary students in Wise Virginia. Through collaboration with ThingLink Expert Educators, I’ve gotten to know Christi quite well and I am truly inspired by her work! In addition to being an active participant in all of our ThingLink Creative Challenges, Christi has served as a panelist in a few of our webinars. Best of all she and her students are quite busy capturing learning as it happens with ThingLink. When we kicked off our end of year ThingLink Classroom Creative Challenge, Bring the Textbook to Life, Christi Collins jumped on board and created a ThingLink to put Wise Primary School in Virginia on our collaborative map of participants. Then she created an interactive newsletter in response to our call to share games at recess and insects on our playgrounds! What a fabulous way to connect with families through a newsletter! More Resources from Bring the TextBook to Life! We’re finishing off the school year by offering some simple Classroom Challenges designed to help teachers and students find enjoyable ways to collaborate and connect as the school year winds down. So grab your mobile devices and take a walk through the neighborhood to capture photos of gardens, search for insects on your playground, or simply brainstorm a list of local landmarks and do some research. We are assembling the images into interactive books that will surely illustrate the similarities and differences of #LivingInTheUs. We hope you can join us! New Topics for Bring the Textbook to Life! We have collected participant feedback to help fine tune our Classroom Creative Challenge to get the most out of the learning as the school year quickly comes to a close. We have selected the most popular topics to offer participating classrooms choices and hope you find these topics simple and enjoyable. To get started, please create an interactive image to Show Us Your School and get added to our interactive map. Then grab your mobile device and take a walk through your schoolyard or neighborhood to capture photos of gardens, search for insects on your playground, or simply brainstorm a list of local landmarks and do some research. We hope you will find something interesting. If not, please make a suggestion. We love feedback! Please join us in exploring one or more of the topics below and help us spread the word to grow the project! We would love to fill our bookshelf with wonderful interactive examples to Bring the Textbook to Life! The votes are in! Here are the results, wordled for the upcoming ThingLink Creative Challenges. 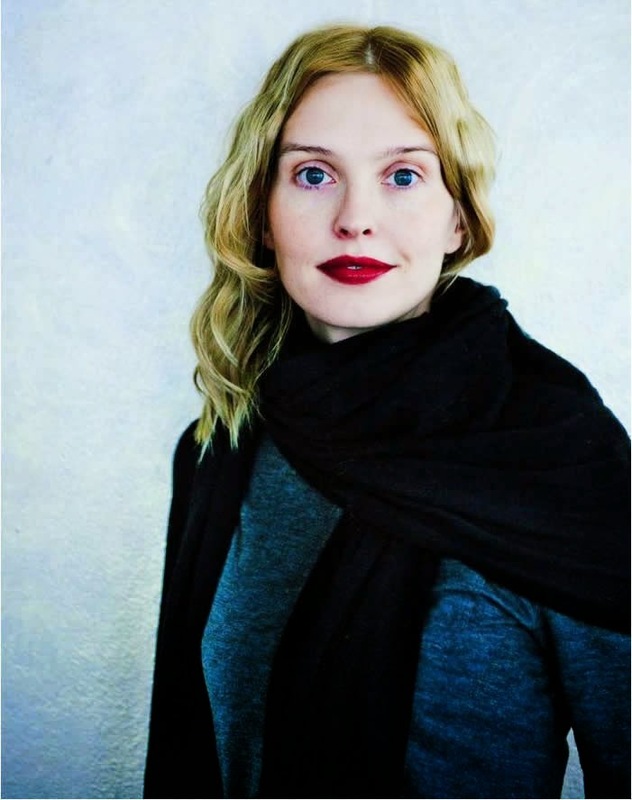 Explore this interactive image to learn why Ulla has decided to participate in the Women Who Tech Campaign. With support from this campaign we can create and share a powerful library of interactive resources for use across all content areas and grade levels. Here are a few of the powerful possibilities for students, teachers and parents. Interactive books can be created when ThingLink images are added to a slideshow channel with the click of a button. These books are very enjoyable to read and explore. Turn the pages in the book below to find images annotated with a variety of media to support all learning styles. Interactive images can tell any story beautifully, whether it’s fiction or nonfiction. One of the best things about Thinglink interactive books is that students can author them too. I like to have students start with an image and construct knowledge through research about a topic as they add layers of media. To help students develop writing and presentation skills I use the opportunity to focus on learning how to write clear and concise descriptions to the image tags. Writing clear and concise text is a useful 21st century skill. Explore this example to image the possibilities for teaching students to write a readable image. Thousands of educators use ThingLink every day to turn images and videos into fun learning experiences. In this campaign we are raising money to collect the amazing creative work of our users into a free library of interactive books, presentations, and videos across all subjects and grade levels, powered by a subject and grade level specific content search on ThingLink. Supporters of this campaign can subscribe to a curated monthly edition of interactive books and videos that support learning across all grade levels to help build our community of educators who create, share and use ThingLink. Explore just a few amazing resources created by ThingLink Expert Educators and consider the possibilities for a comprehensive interactive resource library. One of the best features of ThingLink is the ability to Remix an image to customize it for your own use. Users can start with a ThingLink, click on the Remix tag and make a copy of it for yourself. The existing tags are visible and editable. Users can add additional tags, delete existing tags, and build on the work of others to create a unique interactive resource that is personalized. Teachers and students have embraced and welcomed ThingLink and it been chosen many times as one of the best free web tools for education. Your support will help us make ThingLink an even better resource for all teachers, students, and parents around the world. We hope you will support Ulla’s campaign and help us spread the news!